"I like the info on stuffing a pork chop. I love pork chops so it looks ... read full review"
Stuffing is a side dish commonly associated with turkey and Thanksgiving but it can also be enjoyed throughout the year and with many types of meat. The basis for different stuffing recipes is generally the same. They contain dried bread, cooking liquid and seasoning. Together with the basic ingredients, many other ingredients can be added to produce a unique dish. The recipe can be cooked in the cavity of a turkey or chicken or it can be cooked in a separate dish. When cooked in the cavity, it is referred to as stuffing and when it is cooked outside the cavity in a separate baking dish, it is referred to as dressing. Included below is information on different ingredients and instructions on how to make stuffing. The process is very similar when making it for turkey as it is when making it for other meats such as chicken, pork or beef. The three basic ingredients, bread, liquid and seasoning, each have many options that can be used. Together with these ingredients, there are many other ingredients that can be added to produce great flavor and texture. The information below describes some of the options that can be used. Cooking Liquid Some liquids that are used for moistening the stuffing are stock, broth, pan drippings, melted butter, milk, wine, and eggs. Eggs also add firmness. If using wine, do not use too much because it can overpower the flavor of the stuffing. Vegetables Vegetables can be added for additional flavor. Onions and celery are common ingredients in many recipes but other vegetables can be added to give the stuffing a unique taste and added texture. Some vegetables that are used are carrots, sweet potatoes, red and green peppers, garlic, and chives. The vegetables are only cooked enough to slightly soften so that their flavor is released but they retain a tender-crisp texture. Fruits Fruits add texture and a slight sweetness to the stuffing. Fruits that are commonly used are apples, cranberries, dried apricots, dried plums, raisins, and citrus zest. Meat The stuffing has a hardy flavor when meat is added. Some of the types of meats used in stuffing are pork sausage, Italian sausage, turkey giblets, ground turkey, ground beef, and oysters. Other Ingredients Other ingredients are also added to create a variety of flavors and textures. Some of the ingredients used are rice, mushrooms and nuts, such as chestnuts, walnuts, pecans and almonds. Note: Many of these ingredients can be mixed and matched to create your own unique flavored stuffing. There may also be other ingredients you feel would be good for adding flavor to the stuffing. The best thing to do is experiment with 1 or 2 new ingredients when you are making the stuffing. Avoid adding more than 2 new ingredients at once so it is easier to determine which ingredients you like and don't like. 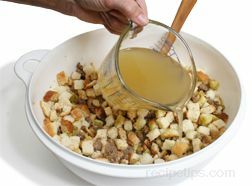 Before preparing the stuffing, determine the quantity needed on the basis that you need 3/4 to 1 cup per person. Have the stock or broth and other ingredients prepared before you begin to mix the stuffing ingredients together. Do not mix ingredients together until just before you are ready to stuff the turkey. The instruction below for preparing the stuffing are for a basic stuffing recipe that includes onions, celery and pork sausage. 1 1/2 to 2 c. turkey or chicken broth or stock. 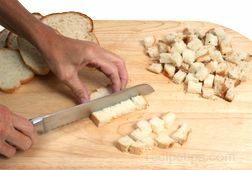 Slice bread into 1/2 inch thick slices if it is not presliced. Cut the slices into 1/2 inch cubes. Spread the cubes out on baking sheets and allow to set out overnight to dry or bake in an oven at 275°F for approximately 20 minutes or until cubes are dry. Stir the bread cubes occasionally while drying so they dry evenly. Be sure bread is fairly dry before using. Do not use moist bread because it will result in soggy stuffing. 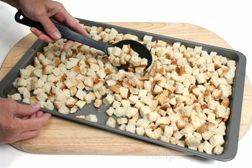 Store bought croutons or stuffing mix can be used in place of drying your own bread cubes if desired. They are available cubed, crumbled, in strips, seasoned and unseasoned. They are also available made from different varieties of bread. If they are purchased from the store, keep in mind that if they are seasoned you will want to adjust the seasoning you add to the stuffing. 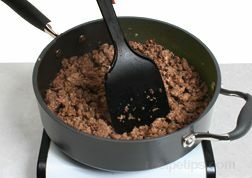 Fry ground sausage and crumble into small pieces. Drain grease and set crumbled sausage aside. Clean and chop the onion into small pieces and set aside. 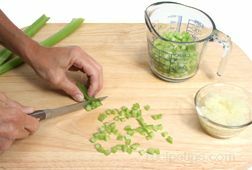 Clean and chop celery into approximately 1/4 inch size pieces. Melt butter in a skillet over medium heat. 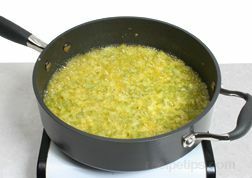 Add the onions and celery to the melted butter and cook until onions begin to soften and turn a light golden brown. The celery should still be slightly crunchy. Remove the onions and celery from the heat and add the sage, salt and pepper. The bread cubes should be placed in a bowl large enough to mix all the ingredients together. 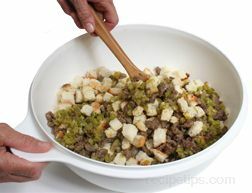 Add the onion and celery mixture and sausage to the bread cubes and stir until the ingredients are well mixed. Begin adding the broth or stock gradually. Only add enough liquid to moisten the stuffing enough for it to hold together. Begin by adding 1 cup or less. Note: Homemade stock, broth made from chicken bouillon, or store bought broth can be used. When adding liquid, remember that the eggs still need to be added, which will add a little moisture also. The eggs should not be added until the stuffing has been taste tested to see if it is properly seasoned. Add more seasoning if necessary after taste testing. 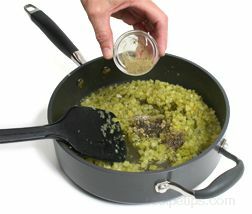 When stuffing is properly seasoned, add the beaten eggs and stir until they are well distributed. If necessary, more liquid can be added after the eggs are added in to further moisten the stuffing but it should not be tasted again until it is cooked properly. Keep in mind that if the stuffing is going to be cooked in the cavity of the turkey, that it should be drier than if cooked in a separate baking dish. It will take on additional moisture from the turkey's juices as it cooks. In order to prepare the turkey for stuffing, remove the neck and giblets, which are usually placed inside the body cavity. Wash the turkey inside and out with cold water. Pat the inside cavity and the surface dry with paper towels. Do not stuff the turkey until just before you are ready to cook it. The stuffing should be completely cooled before placing it in the turkey to reduce the risk of bacterial growth. Turn the turkey so the breast side is down. Lightly insert stuffing in the small cavity of the neck. Fold the neck skin over the stuffing and hold in place by bending the wing tips back to hold it in place. If the wings will not hold the skin in place, trussing needles or skewers can be used. If using trussing needles or skewers to close the neck skin over the stuffing, be sure to fold back the wings before turning the turkey over to stuff the breast cavity. Turn the turkey breast side up and lightly fill the breast cavity of the turkey. Do not pack the stuffing too tightly in the cavity because the stuffing will expand as it cooks. If the stuffing is too dense, it will not cook thoroughly all the way through. 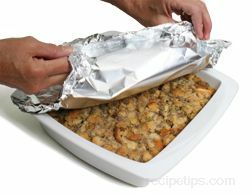 If there is stuffing that does not fit in the cavity, it can be baked in a separate baking dish. After filling the cavity, tuck the legs in at the bottom of the turkey or tie them together with kitchen twine. 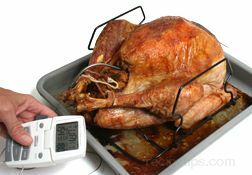 Roast the turkey until the thigh reaches 180°F, the breast reaches 170°F and the dressing is 165°F in the center. Remove the turkey from the oven, tent foil over it, and allow it to stand for at least 20 minutes before carving. Leave the stuffing in the turkey during standing time. The temperature of turkey and stuffing will rise during this time. Remove the stuffing before carving to avoid possible cross contamination. If the turkey gets done before the dressing reaches 165°F, remove the dressing from the cavity of the turkey and place it in a baking dish and continue to bake in the oven until it reaches the appropriate temperature. See Roasting Turkey for more information on cooking instructions and turkey cooking times. Many cooks prefer to place all of the stuffing in a baking dish to cook it rather than cooking it in the turkey. They prefer this method because an unstuffed turkey cooks to the proper temperature faster than when stuffed and it is easier to cook the dressing to the proper temperature without worrying about the turkey becoming overdone. Some people also prefer the crispy top that results from cooking the dressing in a separate baking dish. See the instructions below on preparing dressing. 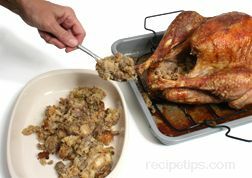 Dressing is the same as stuffing only it is baked in a separate dish rather than stuffed in the cavity of the turkey to be cooked. Prepare the stuffing mix in the same manner as stated above for the stuffing. 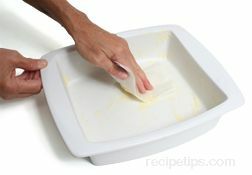 Butter the sides and bottom of a baking dish large enough to hold the dressing. Pour dressing into the baking dish and pat lightly. Pour 1/2 to 1 cup of additional liquid over the dressing in the baking dish. When baking separate from the turkey, the dressing will not be getting the juices from the turkey so additional liquid needs to be added to prevent the dressing from drying out too much. Cover the dressing with foil and seal tightly around all edges. Place in an oven preheated to 350°F. The dressing will need to bake for 30 to 45 minutes, depending on the quantity. If baking a large quantity, the cooking time may need to be increased to have the dressing reach 165°F in the center. Remove the foil from the dressing during the last 15 to 20 minutes of cooking time to allow the dressing to brown. When dressing is nicely browned and its internal temperature reaches 165°F, it is ready to serve. 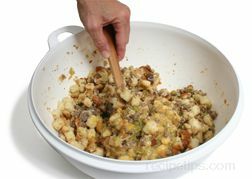 There are many different stuffing/dressing recipes available that call for different ingredients but the basic instructions above can be used for most any type. The ingredients and ingredient preparation may vary but the same basic steps can be followed and the same safety concerns should be recognized. 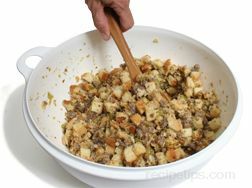 Other types of meats can also be stuffed with a stuffing mixture similar to the stuffing shown above. Meats that do not have a cavity for stuffing can have a slit cut to form a pocket or the stuffing can be rolled up in the meat. Stuffing can be used in crown roasts, extra thick chops or steaks, rolled roasts or rolled into flattened tenderloin. The stuffing can be made from a simple bread base or a wild rice mixture, with ingredients such as onions, garlic, lemon, herbs, and spices added for extra flavor. A variety of other ingredients, such as sausage, vegetables, mushrooms, pecans, and chestnuts can be added to make up a more complex recipe with a unique flavor. It is common to use eggs for binding and stock or broth to moisten the stuffing. When stuffing a crown roast, fill the center of the roast with the stuffing and then cover the stuffing with foil. 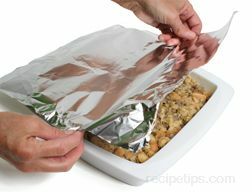 Remove the foil during the last 45 minutes to an hour of the cooking time so that the stuffing can brown. To stuff extra thick chops or steaks make a slit along the side, through the middle of the chop to form pocket to hold the stuffing. To stuff extra thick chops or steaks make a slit along the side, through the middle of the chop to form a pocket to hold the stuffing. Stuff the chop lightly, being careful not to over stuff. 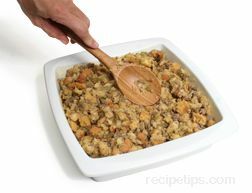 Any remaining stuffing can be placed in a glass baking dish and baked separately. 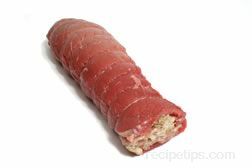 Stuffed rolled roasts and flattened tenderloins generally have a layer of the stuffing spread over the meat and are then rolled up and tied before cooking. If the stuffing contains egg, it must be cooked until it reaches an internal temperature of 165°F to ensure that it is safe to eat. Note: It is recommended by the USDA that stuffing be cooked separately in baking dish rather that in the cavity of the turkey to insure that it is cooked to a safe temperature of 165°F. If you choose to stuff the turkey, be sure to follow the safety tips below. Do not mix stuffing ingredients together the night before to try to save time because this will increase the risk of bacterial growth. Save time by drying bread cubes the night before and preparing other ingredients and then storing separately in the refrigerator. NEVER stuff the turkey in advance. The stuffing may promote rapid growth of harmful bacteria. Stuff the turkey just before roasting. Do not pack the stuffing too tightly in the cavity because the stuffing will expand as it cooks. If the stuffing is too dense, it will not cook thoroughly all the way through. Allow extra cooking time when roasting a stuffed bird. 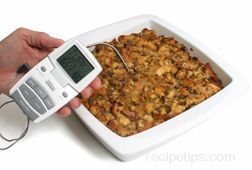 Always use a meat thermometer to verify that the temperature of the stuffing has reached a minimum of 165°F. Leave stuffing in the turkey during the standing time before carving. Remove the stuffing from the turkey before it is carved to avoid cross contamination. 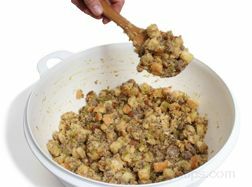 Leftover cooked stuffing should be refrigerated and used within 1 to 2 days and should never be frozen for use at a later date. Leftover stuffing that has been cooked inside the turkey should be reheated to a minimum temperature of 165°F. Use stale, firm textured bread for good textured dressing. Stuffing that is packed loosely will be fluffy and is more likely to cook thoroughly. If stuffing the turkey, make the stuffing slightly dry. It will expand and become moister from the juices produced as the turkey roasts. To moisten stuffing that seems dry after cooking, add chicken broth. 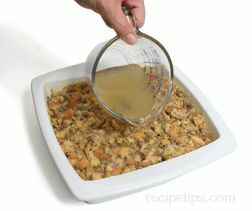 Use only enough liquid to moisten, you do not want the stuffing to be soggy. Most families have a traditional stuffing recipe. Try a new tradition of serving the traditional along with a new recipe. If using instant stuffing, add ingredients such as chopped nuts, cranberries, mushrooms, bacon, or sausage for extra flavor and to give the impression that the stuffing was made from scratch. "I like the info on stuffing a pork chop. I love pork chops so it looks interesting to stuff them. It doesn't look too hard so I will have to give it a try." "I haven't decided if I am going to stuff the turkey or cook the dressing separate but the information on how to prepare the dressing is great and easy to follow. Thanks!" "Good article and very helpful. I didn't realize that stuffing needed to be cooked to a certain temperature. We sometimes stuff the turkey with the dressing to cook it so it is good to know how to tell if it is done." "I have never stuffed a turkey with dressing because I was never sure how to tell if it was done and how to make sure it was done when the turkey was ready to take out of the oven. This article explains how to check for doneness and what to do if it isn't done. I just might try it this year. You would think it would give the dress great flavor." "Wow! Just what I need. My mom always made the dressing but now that she is no longer with us I have to try to make stuffing on my own. I have helped before but never made it on my own. This information will really help me out." "I always struggle with stuffing. This article, with its step by step instructions will help me improve my past attempts."